Above image: This may look like a gruesome monster from the latest sci-fi event movie, but it is in fact a real creature. No need to panic, though, as the hydrothermal worm is so tiny it requires a powerful microscope to see it. The organism, only slightly larger than a bacterium, lives in deep sea near hydrothermal vents that spew hot water from beneath the Earth’s crust. The striking image, captured by Phillippe Crassous, is one of a gallery of minute wonders taken using FEI scanning electron microscope equipment. (ABOVE) This image of a platinum nanowire magnified 5,000 times bears a resemblance to Bristol’s Clifton Suspension Bridge. (ABOVE) By applying some artistic use of colour, a minuscule crack becomes a view of a dusty canyon. (ABOVE) A scanning electron microscope image of coccolithophores, a single celled phytoplankton with an external skeleton made of calcium carbonate. They are what give the White Cliffs of Dover their chalky white appearance. 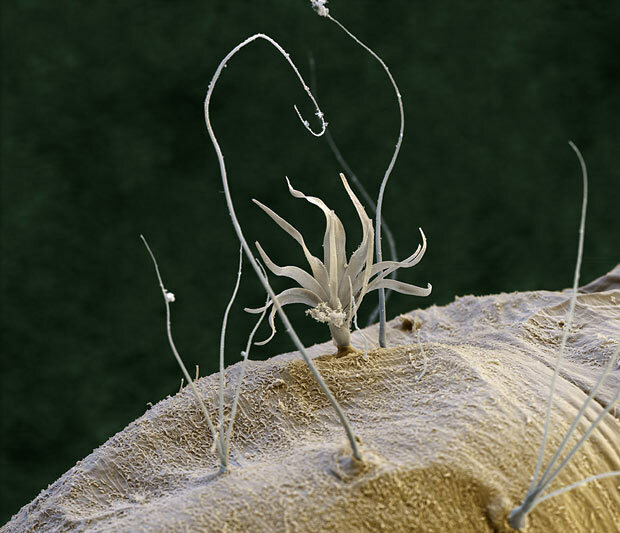 (ABOVE) A scanning electron microscope image of spider silk glands making a thread originally from Dennis Kunkel Microscopy. (ABOVE) A pollen grain from a spruce tree might pass for an alien spacecraft. (ABOVE) Aluminium foil at 10000x magnification could be an aerial view of countryside. (ABOVE) This may look like flowers and grass, but it is an image of hairs on the body of an Anopheles mosquito larva. (ABOVE) Spicules from a sponge found in South African waters. (ABOVE) Ruptured venule. Coloured scanning electron micrograph (SEM) showing stacks (rouleaux) of red blood cells exposed inside a torn venule. A venule is a very small blood vessel in the microcirculation that allows deoxygenated blood to return from the capillary beds to the larger blood vessels (veins). Red blood cells are the most abundant cell in the blood. They have no nucleus and are about 7 micrometers across. Magnification: x2300 when printed at 10 centimetres wide. (ABOVE) Red blood cells magnified 1500x look a little like stars. (ABOVE) Silver particles and copper crystals. (ABOVE) This image shows a nanometre-sized pre-solar grain at NASA’s Johnson Space Centre. The grain is right under the carbon cap on the very top of the pillar. This sample is from a meteorite and the isolated grain was experimentally proved to be a pre-solar grain. The study helped towards understanding the formation of stars in our galaxy as well as the origin of our own solar system. 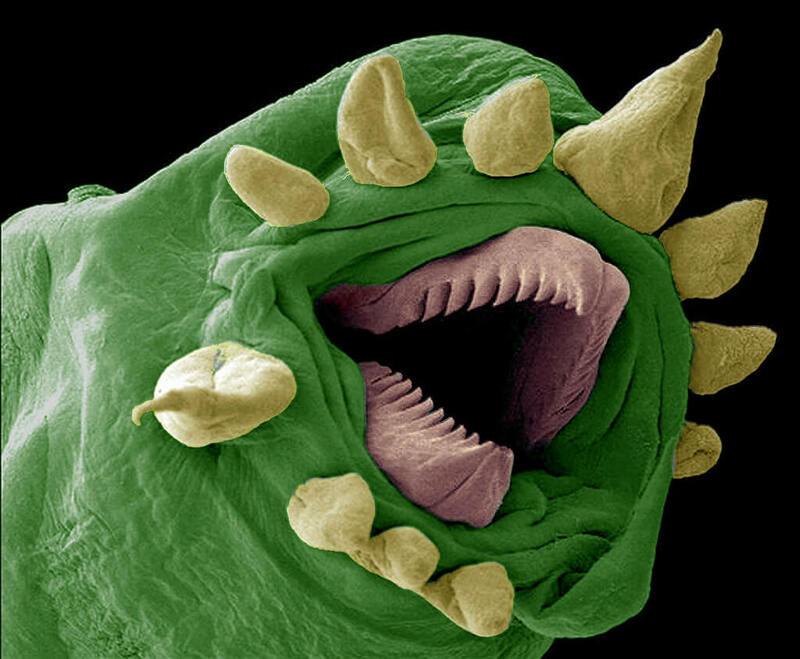 (ABOVE) A microscopic hydrothermal worm. (ABOVE) Microscopic cross section of a Juncus sp. leaf.